How does the content of the online seminars (eCourses) differ from the live seminars? The content delivered in the eCourses contains the same information as is taught in our live seminars but the online format allows us to offer additional time and develop the concepts more completely. Since our online seminars do not have the time constraints of live seminars, we are able to offer more extensive coverage of the concepts along with the benefit for you to create a customized review. What are the advantages of eCourses over live seminars? One of the primary advantages of learning through eCourses is the ability to divide the concepts into modular format. Studies have consistently shown that comprehension of concepts is increased when the material is taught in increments of 1.5 hours or less. When attending a live seminar, you are learning at the pace of the entire class. If a concept is unclear you do not have the option of going back and reviewing the material – you must proceed with the rest of the class. The Pegasus Direct player gives you the flexibility to pause and review while viewing the module or to bookmark areas of interest or weakness so that you can return later and review until you fully understand the concept. How many times can I view the eCourse? The Pegasus eCourses are modeled after our live seminars. Course registration for any live course allows you to attend the course only once, and not return to the next offering of the course for free. But, in creating the Pegasus Direct player for our eCourses, we wanted to give additional features to our customers, one of which is the ability to create a customized review. So, after you have viewed the entire eCourse, you have additional viewing time for review. After completing the viewing and review, your Account Summary will indicate Time Expired for that particular module. If you desire additional instruction on a particular topic, contact our office at techsupport@pegasuslectures.com to have your module(s) reset. Pegasus Lectures reserves the right to not reset modules if the course is being accessed by multiple IP addresses or there are excessive reset requests, indicating multiple users. What if I am interrupted while viewing? If you are interrupted for a brief period, pause the player and resume viewing when you are ready. If you must leave for an extended period of time, simply close and exit the program. The player will remember the section you last viewed so you can resume viewing upon return. How do I create a customized review? In order to maximize efficiency during your review, we have included a feature on the control bar called the playlist. The playlist provides details of the topics covered in each module by time code and subject, allowing you to bookmark any areas in which you have a weakness or that are of particular interest. The player will recall your bookmarks, allowing you to return when you are ready to review. Simply click on your bookmarked topics to complete your review. You can review immediately after watching a module or wait until you have completed the entire course and use the review time as a capstone review – it’s your choice. There is not a date expiration on the eCourse. You can view on your schedule, at your pace. After you have completed both the viewing and review time of a module, your Account Summary will indicate Time Expired for that particular module. It is rare for participants to use all of the optional review time, but as indicated above, if you need additional instruction on a particular topic, we can reset the module(s). 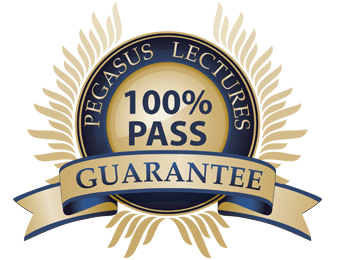 Pegasus Lectures reserves the right to not reset modules if the eCourse is being accessed by multiple IP addresses or there are excessive reset requests, indicating multiple users are accessing the course. I am not able to take the CME quiz at the end of the module after viewing the module in its entirety, am I doing something wrong? If there is a gray area left on the scrub bar (scrub bar turns green as you view) the post-test will not activate. You can try to watch that area again but sometimes it won't fill in. Please contact Pegasus to activate the CME exam. Are the CME credits from the Pegasus eCourses ARDMS-approved CME credits? Yes. All of the Pegasus eCourses offer CME credits that are ARDMS-approved and CCI-approved credits. Is a hard-copy syllabus available to follow along with the online lectures? Yes, the eCourse speakers have graciously allowed their PowerPoint presentations to be available to the participants in a downloadable, PDF format. Additionally, the player has a note-taking feature which allows you to write and print notes while you are viewing the eCourse. How do I access the printable PowerPoint presentations? While viewing a module, click on the Key Concept icon on the player control bar to access the printable PowerPoint presentations in note-taking format. What is the Pegasus Pass Guarantee? It’s not just hype – our customers PASS or return for FREE. Our courses are designed to teach the material in the easiest and most straightforward way possible. We avoid gimmicks and are geared toward teaching the material so that no matter how a test question is posed, you can think your way to an answer. Instead of telling participants that they need to learn "just enough" to get by, we teach them how to incorporate the physics and ultrasound principles into their day-to-day scanning. By teaching the material in the clinical context, understanding and recollection become much easier.